ArabSaga: 12 nuns for 1,000 Syrian women prisoners? Syrian opposition forces are offering to swap some 12 Orthodox nuns they are holding in the Qalamoun Mountains range for 1,000 women prisoners detained by Syrian President Bashar al-Assad’s regime. News of the proposed exchange makes today’s front-page lead of the respectable Saudi daily Asharq Alawsat. 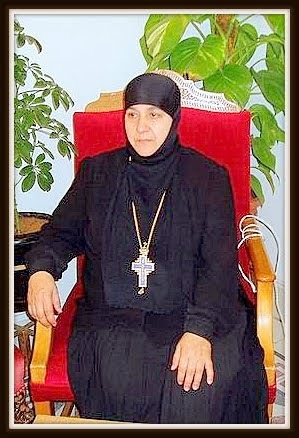 Mother Pelegia Sayyaf is the abbess of St. Thekla (a disciple of St. Paul who faced a heroic and miraculous martyrdom) in Maaloula (which means “entrance” in Aramaic). Some of Maaloula’s residents still speak a version of Aramaic, a biblical language spoken by Jesus. Abul-Feda said the nuns are now in a safe hideaway and protected jointly by Ahrar al-Qalamoun Brigade and Jabhat al-Nusra. The Saudi daily quotes other unnamed sources as saying Jabhat al-Nusra also wants the regime to lift its blockade on food and other supplies in Ghouta near Damascus. Separately, opposition activists again accused Assad forces of using poison gas in Syria’s civil war yesterday, and said victims had been discovered with swollen limbs and foaming at the mouth. The activists told Reuters two shells loaded with gas hit a rebel-held area in the town of Nabak on a major highway in the Qalamoun region. They reported seven casualties.